John Akomfrah is a hugely respected artist and filmmaker, whose works are characterised by their investigations into memory, post-colonialism, temporality and aesthetics and often explores the experiences of migrant diasporas globally. Akomfrah was a founding member of the influential Black Audio Film Collective, which started in London in 1982 alongside the artists David Lawson and Lina Gopaul, who he still collaborates with today. Their first film, Handsworth Songs (1986) explored the events surrounding the 1985 riots in Birmingham and London through a charged combination of archive footage, still photos and newsreel. 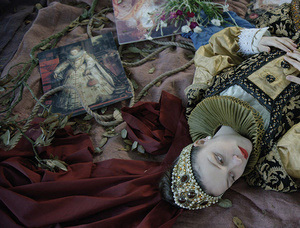 The film won several international prizes and established a multi-layered visual style that has become a recognisable motif of Akomfrah’s practice. Other works include the three-screen installation The Unfinished Conversation (2012), a moving portrait of the cultural theorist Stuart Hall’s life and work; Peripeteia (2012), an imagined drama visualising the lives of individuals included in two 16th century portraits by Albrecht Dürer and Mnemosyne (2010) which exposes the experience of migrants in the UK, questioning the notion of Britain as a promised land by revealing the realities of economic hardship and casual racism. In 2015, Akomfrah premiered his three-screen film installation Vertigo Sea (2015), which explores what Ralph Waldo Emerson calls ‘the sublime seas’. Fusing archival material, readings from classical sources and newly shot footage, Akomfrah’s piece focuses on the disorder and cruelty of the whaling industry and juxtaposes it with scenes of many generations of migrants making epic crossings of the ocean for a better life. In 2017, Akomfrah presented his largest film installation to date, Purple (2017), at the Barbican in London, co-commissioned by Bildmuseet Umeå, Sweden, TBA21—Academy, The Institute of Contemporary Art/ Boston, Museu Coleção Berardo, Lisbon and Garage Museum of Contemporary Art, Moscow. The six-channel video installation addresses climate change, human communities and the wilderness. More recently, Akomfrah debuted Precarity (2017) at Prospect 4 New Orleans, following the life of forgotten New Orleans jazz singer Charles 'Buddy' Bolden. 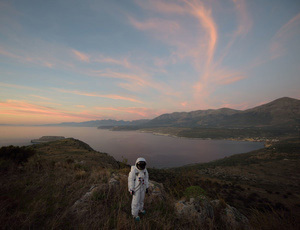 This year, on the occasion of his participation at the first Ghana Pavilion at the 58th Venice Biennale, John Akomfrah will present Four Nocturnes (2019), a new three-channel piece that reflects on the complex intertwined relationship between humanity’s destruction of the natural world and our destruction of ourselves. Akomfrah (born 1957) lives and works in London. He has had numerous solo exhibitions including Museu Coleção Berardo, Lisbon, Portugal (2018); Imperial War Museum, London, UK (2018); New Museum, New York, NY, USA (2018); Bildmuseet, Umeå University, Umeå, Sweden (2015, 2018); Nasher Museum at Duke University, Durham, DC, USA (2018); SFMOMA, San Francisco, CA, USA (2018); Museo Nacional Thyssen-Bornemisza, Madrid, Spain (2018); Barbican, London, UK (2017); Whitworth Art Gallery, Manchester, UK (2017); Turner Contemporary, Margate, UK (2016); Nikolaj Kunsthal, Copenhagen, Denmark (2016); STUK Kunstcentrum, Leuven, Belgium (2016); Eli and Edythe Broad Art Museum, Michigan, USA (2014); Tate Britain, London, UK (2013-14) and a week long series of screenings at MoMA, New York, USA (2011). His participation in international group shows includes: Ghana Pavilion, 58th Venice Biennale, Venice, Italy (2019); 'Strange Days: Memories of the Future', New Museum x The Store, London, UK (2018); Prospect 4, New Orleans, LA, USA (2017); 'Restless Earth', La Triennale di Milano, Milan, Italy (2017); 'Unfinished Conversations', Museum of Modern Art, New York City, NY, USA (2017); 'British Art Show 8’ (2015-17); ‘All the World’s Futures’, 56th Venice Biennale, Venice, Italy (2015); ‘History is Now: 7 Artists Take On Britain’, Hayward Gallery, London, UK (2015); ‘Africa Now: Politcal Patterns’, SeMA, Seoul, South Korea (2014); Sharjah Biennial 11, Sharjah, United Arab Emirates (2013); Liverpool Biennial, UK (2012) and Taipei Biennial, Taiwan (2012). He has also been featured in many international film festivals, including Sundance Film Festival, Utah, USA (2013 and 2011) and Toronto International Film Festival, Canada (2012). He was awarded the Artes Mundi Prize in 2017. Installation view at Barbican Centre, London, UK. © Smoking Dogs Films. Courtesy Barbican Centre. Photography: Justin Piperger.